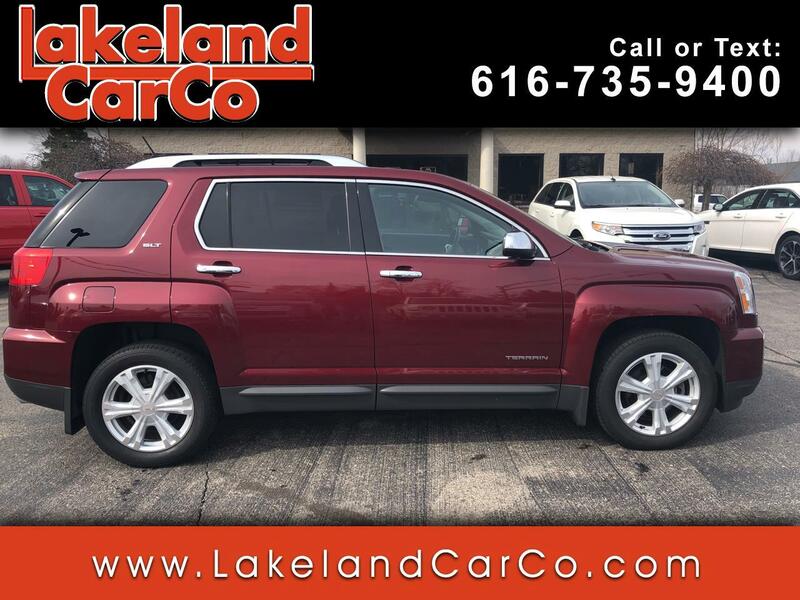 Used 2016 GMC Terrain AWD 4dr SLT for Sale in Grand Rapids MI 49534 Lakeland Car Co.
With stunning good looks inside and out, our 2016 GMC Terrain SLT AWD SUV presented in Quicksilver Metallic is the total package! The 3.6 Liter V6 powers out 288hp while paired with a 6 Speed Automatic transmission which results in an exceptionally quiet ride, great handling, and near 24mpg on the open road in this impressive All Wheel Drive. The distinctive exterior of our SLT stands out with a striking grille, roof rails, and chrome clad wheels. You'll appreciate the convenience of remote engine start as you admire the graceful lines of the dash, comfortable perforated leather on heated seats, and leather-wrapped steering wheel. With a Pioneer audio system, touchscreen interface, available satellite radio, an auxiliary audio jack, an iPod/USB interface, Bluetooth, and available OnStar with a WiFi hotspot, maintaining a safe connection to your digital world will be no problem!